From the Star Wars The Last Jedi collection by Hasbro. Star Wars The Last Jedi Remote Control BB-8 Droid. From the Star Wars The Last Jedi collection by Hasbro. 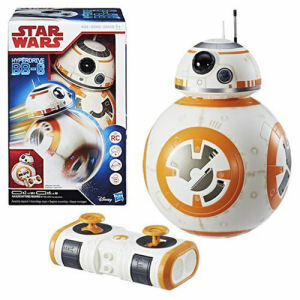 Star Wars The Last Jedi Remote Control BB-8 Droid. Droid has movie accurate movements and sound effects. Requires 4 1.5V AA and 2 1.5V AAA alkaline batteries that are not included. Ages 5 and up. Hasbro Star Wars Electronics shipping from Canada. No Surprise Border fees or Customs!